I’m a firm believer in ‘try before you buy’. Especially when you’re investing in something as special as family photography which for some of you can be a once in a lifetime purchase or be the start of creating a wonderful storybook of your family as it grows. Because I’m so passionate that you should have the chance to experience a family photo shoot and see what charming and amazing images, I offer you something unique. I do not charge for my time with you on the day of the shoot. This means that you can enjoy the photo shoot without the commitment to buy any photos from me. All I ask, is that you pay a £100 deposit which will go towards your final gorgeous photographic prints, albums, digital images and frames. This also secures your time with me on the day of your shoot and is fully refundable if you decide not to make a purchase from me. It’s never happened!! So what products can I offer you after your photo shoot? If you’re like me, when it comes to making choices, I prefer to have a little guidance but also some flexibility so that I get exactly what I would like. That’s why I offer you a few simple collections to get you started in deciding what products you would like to enjoy your photos. Of course these collections might not be exactly what you’re looking for and I totally understand. That’s why I offer all of my clients a bespoke service when it comes to deciding on how they want to enjoy their photographs. Bespoke, in this case, doesn’t mean unaffordable! It just means that I listen to you and want you to have the products that you’re after. I’m here to help you. For example you may have a space on a wall at home that you’d like to display your photos or a particular frame you’d like to use. No problem, let me know and I’ll sort it out for you. And if you’re struggling for ideas and which photos to display then let me know and I can give you some creative guidance! A collection of professionally printed photos beautifully framed with mount for you to display your photographs in your home. ‘Your Story’ frame. 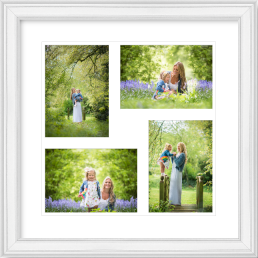 A wonderful 24″ x 24″ frame for nine of your favourite shots telling the story of your photo session. Each photo is 6″ x 6″. or ‘The Charming Four’. 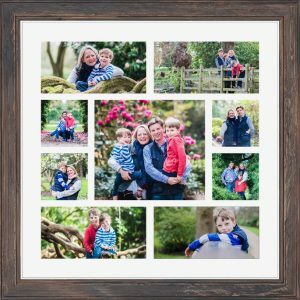 This frame is 20″ x 20″ and holds four of your most cherished shots all printed at 7″ x 7″. 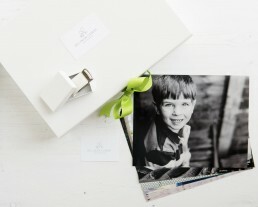 A 12″ x 12″ album with 20 stunning lay flat pages displaying your favourite shots. The album can be personalised with etching of your choice of words on the beautiful natural hessian cover. Once payment has been received, I will go ahead and place the order for you and within five weeks you’ll be enjoying some wonderful photos. Thank you so much for the stunning photos. with her present. Lots of love and thanks. Belinda has a knack of capturing both the moment and the essence of my children. The photos she has taken of my daughters are natural and fun. Can’t wait for the next photo session. With untold thanks for your prompt and skilful help with the photographs.